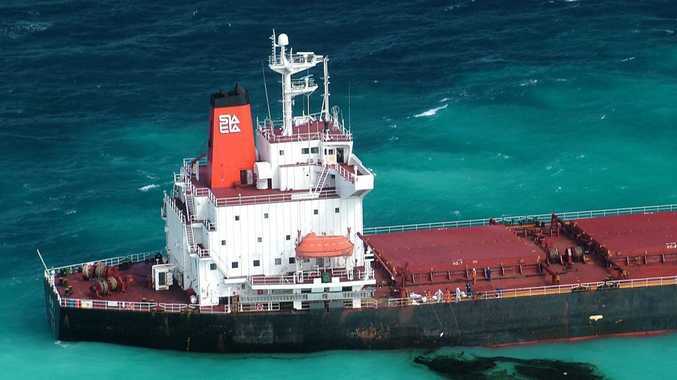 Chinese oil tanker Shen Neng 1 crashed into the Douglas Shoal near Gladstone more than five years ago. CLEAN up of highly toxic paint has still not begun after oil tanker Shen Neng 1 crashed into the Great Barrier Reef more than five years ago. The tanker left a scar 3km long and 250m wide after it crashed into the Douglas Shoal, north-east of Gladstone on April 3, 2010. Great Barrier Reef Marine Park Authority chief Russel Reichelt on Monday night spoke to a Senate Estimates hearing on the issue. He said that it was now "urgent" that action be taken to clean up the paint, but despite five years elapsing since the accident, no action had actually been taken. That was due to the court action, where the government is seeking for the owners of the vessel to pay for the damages and clean up. Greens Senator Larissa Waters said on Tuesday the court case had already "dragged on for two years" and it was time to clean it up. She said the government should take action, rather than wait for the outcomes of the court case which has been ongoing since 2013. The GBRMPA expressed concerns a year ago that the paint was inhibiting coral growth, and may be spread by wave action. Capricorn Conservation Council: Are shark nets too much?